Read the attached flyer for more information. A lawsuit was filed on November 9, 2017 by Shelley and Randy Huskins in the 443rd District Court of Ellis County against the City of Italy. The lawsuit alleges the damages and injuries suffered by their family were the direct and proximate result of the negligence, deliberate indifference, gross negligence and callous disregard of them. See attached letter from Italy City Hall. Italy City Council Election packets are available to be picked up beginning today (January 17, 2018) through February 16, 2018 at 5 p.m.
UPDATE: Trash services will run on their normal schedule on Tuesday, January 16. City Hall will be closed Tuesday, January 16, 2018 due to inclement weather. With just over a week until the community wide event, requests are still coming in. If you are planning on having a garage sale next weekend, October 7, 2017 (no city permit needed) please get signed up so that your location can be included on the map that will be handed out to shoppers. The City of Italy has changed garbage collection companies. The new company will be Access disposal. Access will begin collecting the garbage Tuesday October 3rd. Please leave trash cans out by the curb today after trash pick up. DCI will be coming around to collect them. 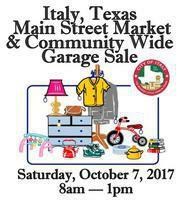 Italy’s 2017 Main Street Market and Community Wide Garage Sale is 15 days away! Get signed up and hold your spot! Weather outlook shows the temps to be in the low 80’s!—Great weather for getting rid of all your neat treasures!!! I could tell everyone about the streets that Ellis County precinct 3, are currently working on to help this City improve the streets. Instead of a mayoral update this month we are asking the citizens of Italy to give us your opinion on garbage collection. I hope everyone had a great time at the recent Italy Shop with a Hero softball game/fireworks show. This is an event that helps to create a atmosphere of unity amongst the community and together we can do more. This letter will serve as the first of monthly news updates to be published in the Italy Neotribune and on the City of Italy Facebook page. Due to a water main break, the Texas Commission on Environmental Quality (TCEQ) has required our water system 0700028 to notify customers of the need to boil their water prior to consumption. This notice will affect N. Couch, Dallas, McConnell, Chad, Rhonda, Cherie, & Hyles Streets. 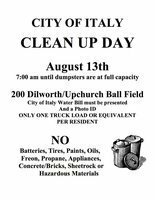 The City of Italy is doing a second clean up day on August 13, 2016 at Upchurch Ball Fields (200 Dilworth, Italy). It will start at 7am and continue until the dumpster is full. This is only for city residents with a current city water bill with a photo ID to match the bill. Only one truck load will be accepted. 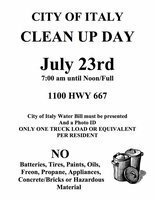 The City of Italy is doing a clean up day on July 23rd at 1100 Hwy 667. It will start at 7am and continue until the dumpster is full. This is only for city residents with a current city water bill with a photo ID to match the bill. Only one truck load will be accepted. Please lock all doors and bring valuables inside. If any of you see anyone suspicious in your neighborhood please call 972-937-6060 and have an Officer dispatched to your location. Italy City Hall will be closed tomorrow, Wednesday, November 11, in observance of Veterans Day and it will also be closed on Friday, November 13. Temporarily Relocating: Italy City Hall be temporarily relocating down the street to the community center on Saturday, November 14, while Italy City Hall undergoes repairs. Water Bill payment details are listed within this article. 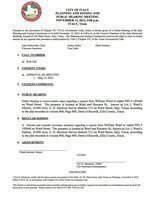 The City of Italy will receive bids for Lot 1, 2, and 3 Block 11, Original Town of Italy, also known as 101 E. Main Street, Italy, Ellis County, Texas, until 5:00 pm on August 14, 2015 at City Hall, 101 W. Main, Italy, Texas, 76651. The bids will be publicly opened and read aloud at 6:00 pm on August 24, 2015, in the Council Chambers of the Italy Municipal Building, located at 105 Main Street, Italy, Texas. Since the election we as the governing body and the employees have been very busy. I want to update the citizens on the progress being made by each department. Due to the damage of the storm last night the City will have a dumpster at the Water Barn this afternoon for brush only. They ask that the brush be cut into 4 foot sections to be able to put as much as possible in there. 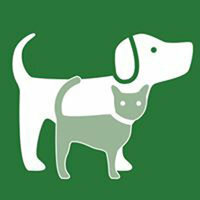 Does Your Dog or Cat Need Vaccinations? There will be a low cost Vaccination Clinic on Saturday, March 14th, 2015 from 1:00pm to 3:00pm at the Italy Water Department Building. The CITY OF ITALY water system PWS ID 0700028 has violated the monitoring and reporting requirements set by Texas Commission on Environmental Quality (TCEQ) in Title 30, Texas Administrative Code (30 TAC), Section 290, Subchapter F.
The City of Italy honored local resident, Altha McNeely, on Saturday, December 6, 2014 at the annual Christmas parade and festival. Altha moved to Italy when she was in the 4th grade. She is a long time member of First Baptist Church. 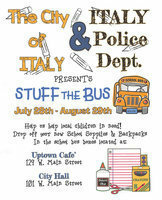 Help local children in need and drop off your donations of new school supplies and new backpacks inside the School Bus Boxes located at Italy’s Uptown Cafe and City Hall. STUFF THE BUS! Here was the culprit on Harris Street. Dean Carrell said it could have been in the ground since the 60’s. A former Water Department employee stopped by and he said that 10 years ago they couldn’t use the cut off on this valve. North Central Texas Council of Governments asked City of Italy’s Public Works Director Dean Carrell to speak at their 15th Annual North Texas Public Works Roundup. Mr. Carrell was part of a workforce issues panel and discussions. Carrell spoke to the public works professionals from across the region on managing regional issues. 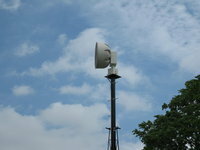 The City of Italy is proud to announce that the new warning siren has been installed and tested. 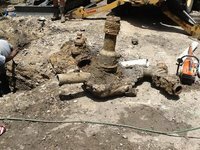 On February 24 ,2014 March 12, 2014 the City of Italy’s Works Water System will be changing the disinfectant that use from chlorine to chloramines. This change is intended to benefit our customers by reducing the levels of disinfection byproducts (DBPs) in the system, while still providing protection from waterborne disease. Dean Carrell, Italy’s public works director, was convicted of felony theft while serving as City Manager of Sonora, Texas. Records obtained by the Italy Neotribune reveal that Carrell pled guilty on December 13, 2011 to a second degree felony of theft as a public servant. Carrell’s plea agreement was a ten year suspended sentence, eight years probation, $1000 fine, 240 hours community service, $249 court costs, and $20,000 in restitution. As the wife and I neared the house about 4 pm on Tuesday, from a long day in Dallas, we saw that beast that everyone hates to see near their home. The city backhoe amid running water. The following are public notices received by the citizens of Italy today in the mail. The notices were reproduced verbatim. 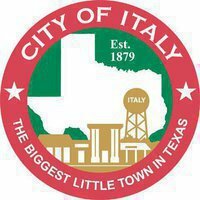 Residents of Italy, Texas are cordially invited to attend a public reception for Mayor Frank Jackson for 14 years of dedicated service to the City of Italy on May 30, 2013 at 5:30 pm, at the Italy Boze Community Center. You are invited to share in the serving of refreshments, and to extend your appreciation to Mayor Jackson as well as wish him well in the future. Dean Carrell, director of public works for the City of Italy is really proud of the progress being made concerning our water. The State of Texas told us we needed better water production, more water storage and better treatments for our water and the public works team did not waste any time going to work on it. These two folks are very humble in receiving the Citizen of the Month recognition. In fact, they thought someone put the sign at the wrong house. They even went so far as to call Mayor Jackson to make sure the sign was in the right yard! 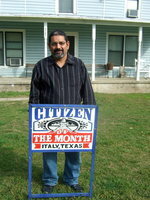 The ‘Citizen of the Month’ for March has lived here his whole life! He loves Italy, loves the people and is right at home in his rocking chair on his front porch waving at all who passes! Yes, I am talking about Joe Tovar. 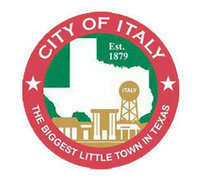 The City of Italy has posted a notice for a public meeting to be held Monday, April 8, 2013. The purpose of the meeting will be to consider and review the Curfew Ordinance’s effects on the community and on the problems the Curfew Ordinance was intended to remedy. The meeting will be held in the Council Chambers of the Italy Municipal Building, located at 105 W. Main Street, Italy. Meeting time is slated for 6:00pm. 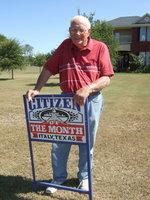 Citizen of the Month for February is no other than Don Chambers. Not only has he lived in Italy since he was a freshman in high school but he has also served our community with his fire fighting skills since 1973. Is it any wonder he is the ‘Man of the Hour"’ this month? Mark your calendars! 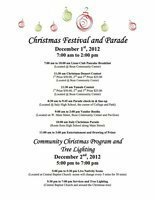 December 1, 2012 is the day that Italy will have a fun hometown event for everyone! The 5th annual Christmas Festival will have a few new twists this year. In addition to the event being centered around the soon to be completed Italy City Pavilion, the Italy Park board has added a Christmas dessert contest as well as a homemade tamale contest—both with cash prizes! The City of Italy’s Planning & Zoning Commission will conduct a public hearing on Tuesday, November 13, 2012. 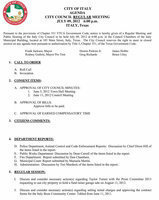 Meeting time is slated for 5:00pm in the Italy Municipal Building Council Chambers at 105 West Main Street, Italy. The City of Italy hosted a ceremonial ribbon-cutting to dedicate the town’s new community center as old friends return home to the Italy Opry. There will be a ribbon cutting for the Italy Boze Community Center on Saturday, October 13, 2012. 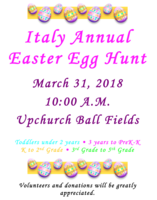 The community is invited to the festivities that will begin at 6:30pm at 161 W. Main Street, Italy. 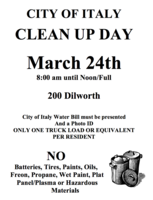 Refreshments will be provided by Italy City Hall. 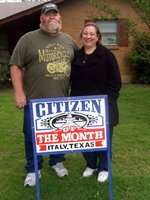 Every month Mayor Jackson selects a citizen of Italy, Texas to be honored as the ‘Citizen of the Month’ and this month he chose Tom Little. 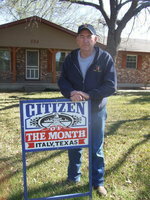 Greg Anderson was born and raised in Italy, Texas and has lived here for forty-four years. 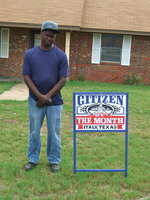 He was very shocked when his daughter Brianna called him in Dallas and told him he was Citizen of the Month. The Italy City Council will have their monthly meeting on Monday, July 9, 2012 in the Council Chambers at 105 West Main Street, Italy. Meeting time is set for 6:00pm. The Italy Water Tower is receiving a fresh coat of paint from courageous painters. One giant step for the City of Italy as it upgrades to satellite linked water meters in a money saving venture with RG3 Utility out of Hallsville/Red Oak.